The transmission of these Musalsal narrations is something transmitted from the early Muslims (Salaf) and down through the ages until this time by scholars of hadith and keen students of knowledge who primarily belong to the major Sunni Madhhabs (Hanafi, Maliki, Shafi’i and Hanbali). One who looks into the biographies of many of the transmitters in every Musalsal chain of transmission can identify the Madhhab affiliation of the narrators in terms of jurisprudential (fiqhi), creedal (aqida related like Ash’ari and Maturidi) or at times the spiritual affiliation (suluk/tariqa) also. Here follows the download link followed by a succinct article on what precisely is a Musalsal hadith and its specific uniqueness. The Shaykh of our Shuyūkh As-Sayyid Abul Faḍl ‘Abdullah ibn As-Siddiq Al-Ghumāri said: “For a scholar, thesanad is like a chain that links him to the Prophet ^. Wherever he moves, the chain moves with him and therefore, whoever has been given the chain, his knowledge will be blessed. As for a scholar who has knowledge but does not have such link to the Prophet ^, he will be like a circle that is disconnected from the rest of the chain, whenever he moves, he moves alone. Sooner or later, he will witness how much barakah(blessings) he has lost. This barakah is an immaterial thing that is witnessed on those who are linked to the Prophet ^ and follow his footsteps. The difference between the attribute and the state is that while the former is permanent the latter is temporary. This attribute of tasalsul describes the chain obviously not the text of the ḥadīth. 4- The one in which the chain includes a verbal attribute of the narrators like the ḥadīth in which the narrators read Surat Aṣ-Ṣaff. Ibn Ḥajar said: The most authentic musalsal in the world is the one in which narrators read Surat Aṣ-Ṣaff. 9- The one in which the narration has happened at a specific date like the famous ḥadīth which is narrated first to every student by his teacher known as ḥadīth al-awwaliyyah. In addition to the benefits of preserving the attribute of the chain and linking people to the example of the Prophet ^, the tasalsul makes it easy for the narrator to relate the ḥadīth to an unforgettable experience. It is because of this that some scholars relate anecdotes (laṭā’if) and benefits (nikāt) about some musalsalāt. For instance, when a scholar went to listen to some musalsalāt from a female muḥaddithah and she came across the ḥadīth in which the narrators hold their beard, she realized that she had no beard to hold, so she held her chin instead. This article was completed by the grace of Allah just before the dawn of Thursday 7th of Dhul-Ḥijjah 1432 – 3rd of November 2011 by this insignificant sinful slave of Allah. 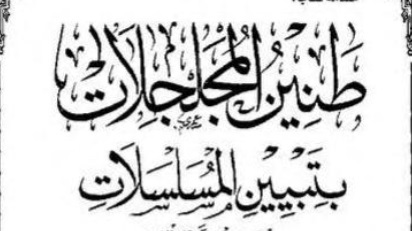 اللهم صلِّ على سيدنا محمد الفاتح لما أغلق والخاتم لما سبق ناصر الحق بالحق والهادي إلى صراطك المستقيم وعلى آله حق قدره ومقداره العظيم والحمد لله رب العالمين. Muḥammad Al-Murtaḍa b. Muhammad Al-Ḥusayni Az-Zabīdi known as Abul-Fayḍ and Abul-Waqt born 1145 AH in Belgram in India and died in Cairo in 1205 AH. A great scholar, muḥaddith and linguist of his time. Amongst his works is his commentary on Al-Ghazali’s ‘Revival of Religious Sciences’ and commentary on Al-Qamus Al-Muḥīt known as ‘Tajul ‘Arūs’ in 14 volumes in addition to his 1000 poem in Ḥadīth. Ibn Aṣ-Ṣalāḥ, Abu ‘Amr ‘Uthman b. ‘Abdirraḥman Al-Kurdi (577 – 643 AH) a great scholar of hadith, born in norther Iraq and moved to Mosul and settled in Damascus where he taught at Darul Ḥadith Al-Ashrafiyyah and died there. Of his famous work, his book Ma‘rifatu Anwa‘i ‘Ulūmil Ḥadith known as the Muqaddimah of Ibn Aṣ-Ṣalāḥ. Ibn Ḥajar, Aḥmad b. `Ali b. Muḥammad Al-Kināni (773 – 852 AH) a great scholar of all times specialising in ḥadīth, history and many other sciences, was born and died in Cairo. `Usāmah b. As-Sayyid b. Maḥmūd b. Muhammad Al-Azhari (b. 1396 AH) a modern scholar and a greatmuḥaddith born in the Egyptian city of Alexandria. He holds a PhD in Ḥadīth and works as a lecturer at Usūl Ad-Dīn Seminary in Al-Azhar University. He also teaches at Al-Azhar Mosque various sciences including logic, theology, principles of Islamic jurisprudence and ḥadīth. He narrates from more than 500 Shuyūkh from different parts of the world and is highly respected amongst scholarly circles in different Muslim countries. He is a prolific and innovative author as well; amongst his works: The Revival of the Sciences of Ḥadīth, Introduction to the Principles of Tafsīr, The Chains of Egyptians, Mu‘jam Ash-Shuyūkh or Collections of Teachers which is a collection of selected biographies of around 75 of his teachers.